Pile Foundation. Pile foundations are deep foundations used when the site has a weak shallow bearing strata making it necessary to transfer load to a deeper strata either by friction or end bearing principles. Foundations provide support for structures by transferring the load to the rock or layers of soil that have sufficient bearing capacity and suitable settlement characteristics. There are a very wide range of foundations types available which are suitable for different applications. Foundations are classified mainly as Shallow foundations and Deep foundations. 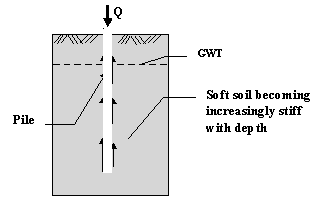 Shallow foundations are used where the load imposed by a structure are low relative to bearing capacity of surface soils. Deep foundations are necessary where the bearing capacity of the surface soils is insufficient to support loads imposed on it and hence they are transferred to deeper layers with high bearing capacity. Pile foundations are deep foundations which are formed by long slender columnar elements. 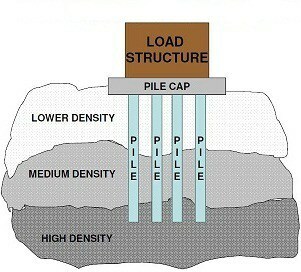 They consist of two components: Pile cap and single or group of piles. 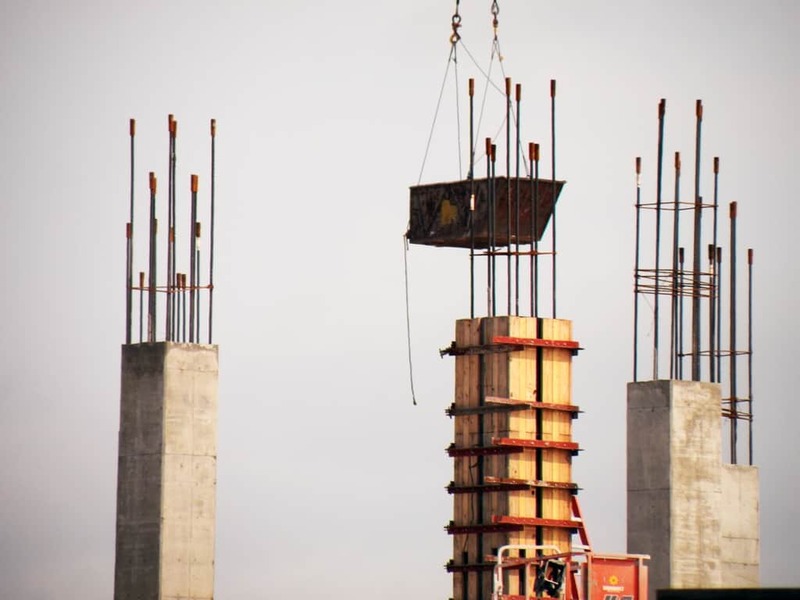 Pile foundations are principally used to transfer the loads from super structure, through weak compressible strata or water on to stronger, more compact, less compressible and stiffer soil or rock. This type of foundation is used for large structures and also in situations where the soil is not suitable to prevent excessive settlement. The pile foundations are classified based on load carrying characteristic of piles, material of pile construction and type of soil. These transmit most of their loads to the load bearing layer (which can be dense sand or rock). Most of the pile capacity is inferred from the end bearing point. 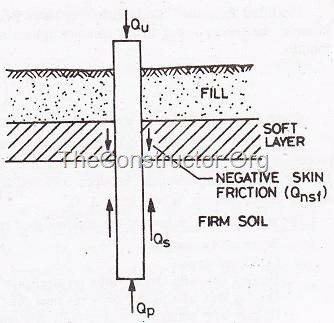 These transmit their load through the layers through which the piles pass which is mostly through the surface friction (skin friction) with the surrounding soils. Here the piles are driven to such a depth that the frictional resistance which is developed at the side of the piles equals to the load coming on the piles. Timber can be used for manufacture of temporary piles and also for permanent ones in regions where timber is readily and economically available. It’s most suitable for long cohesion piling and piling under embankments. Steel can be used for both temporary and permanent works. They are suitable for handling and driving for piles with prolonged lengths. Their relatively small cross sectional area along with the high strength makes penetration easier in firm soil. If it’s driven in to a soil with low Ph value, there may occur a risk of corrosion which can be eliminated by tar coating or cathodic protection. Concrete is used to manufacture of precast concrete piles, cast in place and pre-stressed concrete piles. 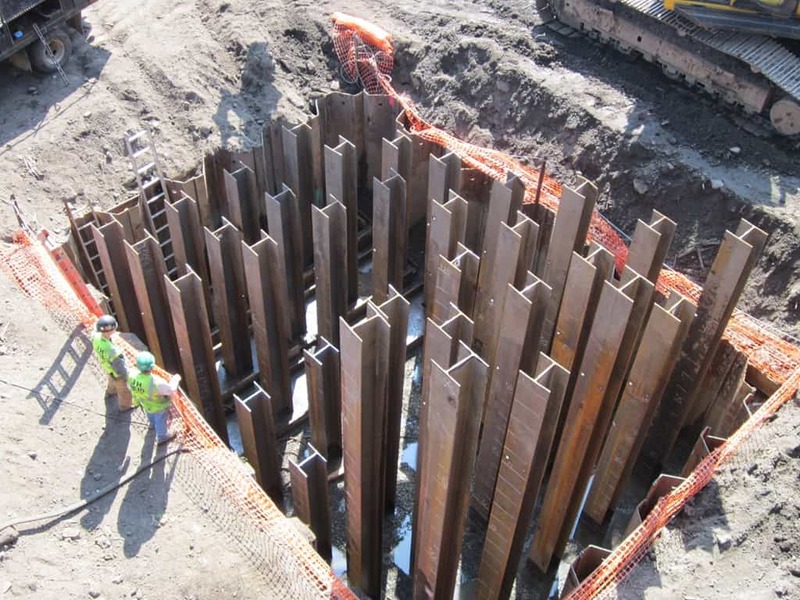 Pre-stressed concrete piles are becoming more approved than the ordinary pre-cast as less reinforcement is required. When a pile consists of a combination of different materials in the same pile, it’s called as Composite pile. For example, part of timber pile which is installed above ground water could be endangered to insect attack and decay. So to avoid this, concrete or steel pile is used above ground water level whilst timber is installed under the ground water level. In this process of driving of pile into the ground, soil is moved radially when the pile shaft enters the ground. There may exist a component of movement of the soil in the vertical direction. 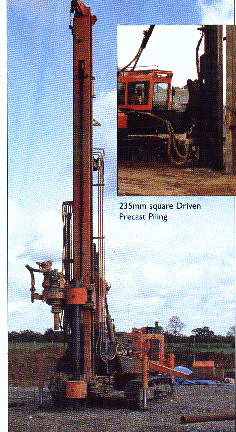 Hence driven piles are considered as displacement piles. In this process, a void is formed by boring or excavation before pile is introduced into the ground. 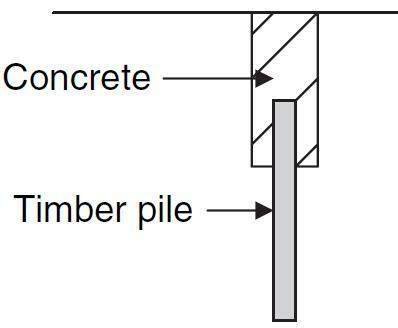 Piles can be produced by casting concrete in the void. Boring piles are considered as non-displacement piles. In pile foundations, Installation process and methods of installation are equally important as the design process. During the design of piles, the installation method and equipment should be carefully selected in order to avoid the damages to the pile. 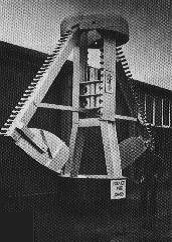 Dropping weight: A hammer with approximately the weight of the pile is raised to a suitable height and is released to strike the pile head. Vibration: The amplitude of vibration used here should be sufficient to break the skin friction on sides of pile. This is bested suited for sandy or gravelly soils. Jetting: To aid the penetration of piles in to sand or sand gravel, water jetting can be employed. Continuous flight auger (CFA): If boring and pouring takes place simultaneously during pile driving, then they are called CFA piles. Here the equipment comprises of a mobile base carrier fitted with a hollow main flight auger which is rotated and driven into the ground to get the required depth of piling. This method is especially effective on soft ground. Underreaming: This is a special type of auger bored piles which is used to exploit the bearing capacity of respective strata by providing an enlarged base. 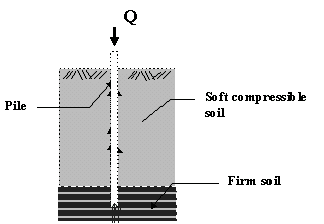 The soil should be capable of standing open unsupported to employ this technique. When a fill or load is placed on compressible soil deposit, consolidation takes place. When the piles are driven through the soil deposit before consolidation is complete, the soil will move downward relative to the pile. The downward movement of the soil develops skin friction between the pile and the surrounding soil and it’s termed as negative skin friction. It can also be developed from lowering the water level in compressible soils such as clay, mud and soft soil and also due to increase in stress.